In the region of Lazio in Italy a grilled chicken is prepared called pollo alla diavolo, chicken devil-style, meaning it uses black pepper or chile for a piquant taste. But one should understand that an Italian cook's conception of piquant is very mild compared to an American familiar with, say, Mexican food. The name of this recipe, said to have originated in Rome, is applied to two very different methods. In Rome and Florence (in Lazio and Tuscany, respectively) cooks like to coat the chicken with olive oil, lemon juice, and lots of black pepper before grilling; hence the name alla diavolo, or hot as the devil. In southern Italy the use of dried chile is more common and the chicken is marinated in white wine and sage and then grilled and served with salt and pepper. In either case, the common technique is to split the chicken open down the middle of the back, spread it out, and flatten it by heavy pounding on the breast with the side of a cleaver or a mallet. This is called spatchcocking. 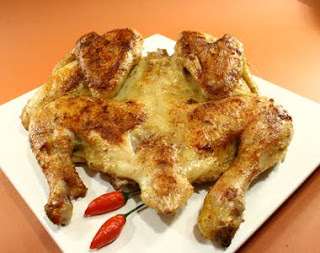 The chicken must be basted constantly with butter or olive oil so that it doesn’t dry out. When finished, it has an appetizing golden-brown sheen. Reading this post is really awesome experience. i gain really informative information. really appreciate this blogger.. Organized content is the best way to display or post an article, thank you for making it easy to digest your post. Your blog is excellent. Let me inform You one thing that post have become most up-to-date and vital source of quality free information.